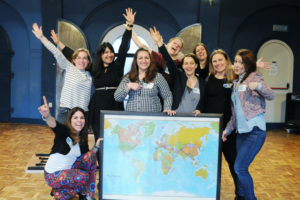 We are a group of international women in and around Arnhem who are looking forward and helping one another achieve our dreams. We come from all over the world, but we have chosen to live, work and play here. Many of us are mothers; many of us are looking to carve out our identity. All of us are looking to build a supportive and interesting community. We share experiences in common and we embrace our differences so that we can learn from one another. We use this as a strength to support each other and excel in our specialities. Our Steering Group itself has six nationalities and years of experience in the Netherlands. And then there are all the extra volunteers that support the growth and development of the Stichting. We aim to support you in finding your place and feeling at home. We share information, stories, ideas and events to help you get the best out of being here. If you want to get involved then please get in touch. We are always looking for people to assist in the progression and expansion of the community that we are so proud and happy to be part of. Enjoy the website and we hope to see you at an event soon. Don’t wait for someone to open the door for you. Jump to the front and push that door wide open with both hands. Together we build our own pathways and find our place in the community.